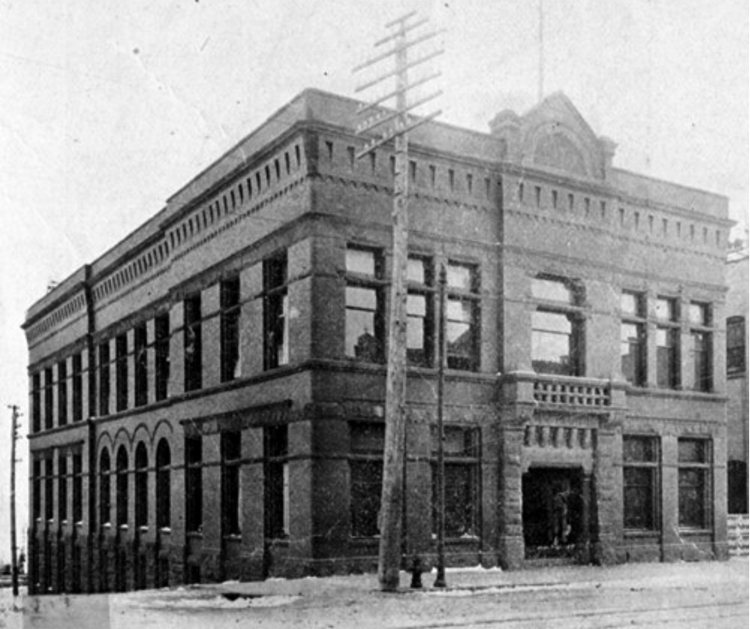 Prior to the construction of this building, Duluth’s government and municipal court operated out of offices “on the second floor of a Superior Street saloon.” When Duluth regained its city charter in 1887—it had lost it for financial reasons in 1877), city leaders decided to celebrate by investing in public facilities. Duluth commissioned Oliver G. Traphagen to design a City Hall and Police Station/Jail next door. Traphagen, the Zenith City’s premier architect at the time, specialized in the Richardsonian Romanesque style, which used heavy building materials such as brownstone. He designed many of Duluth’s public and private buildings and the homes of a number of Duluth’s leading citizens. When it first opened, the building’s first floor (Superior Street Level) held offices for the City Clerk, the Health Department, the Building Inspector, the City Engineers office and drafting room, the Board of Public Works, the Parks Department and, until the Police Station and Jail was built, the office of the Chief of Police. City Hall’s second floor housed the Mayor, who enjoyed a private office with a balcony overlooking Superior Street from which to address the people (though we have no record of any mayor using it this way). Offices for the city’s treasurer, auditor, attorneys, and comptroller were on this floor as well, as were the City Council Chambers and committee rooms. The City Council Chamber witnessed many debates that shaped the city, including the 1912 argument to change the way the city was governed, the legal wrangling to construct the aerial bridge from 1900 to 1905, and the sometimes loud, often angry battle among city officials as they argued how best to convert the Duluth’s Aerial Bridge into the lift bridge that today is the city’s most iconic landmark. The construction of City Hall was completed before the jail next door was built, so for a brief time the Police Department was also housed in this building in the basement (Michigan Street) level, which was also home to the city’s municipal court. The sub-basement contained mechanical rooms for heating and cooling as well as a holding cell for prisoners of the police department. When the 1889 City Hall was constructed, Duluth had several small jails located throughout the city because of its uniques geography (Duluth is roughly three miles wide and 28 miles long). So prisoners were transported from the smaller jails and placed in the holding cell while awaiting their trial in municipal court and, often, transport back to jail after their case was heard. Once the 1890 Police Department and Jail was constructed, the holding cell was no longer used, as a walkway between the two buildings—unofficially Duluth’s first “skywalk”—allowed prisoners to be transported efficiently from the jail to the municipal court. In 1909 the municipal court moved to the second floor of 124 East Superior Street—directly west of the Police Station and Jail (Shel-Don Reproduction today)—to provide more room for city business in the cramped City Hall. But the building had its issues. Almost from the moment it opened it was considered cramped. By 1908 there was a plan to replace it. A renowned national architect had designed a civic center for Duluth in the neo-classical tradition on his City Beautiful movement that would include a county courthouse, county jail, federal building, and city hall. While the St. Louis County Courthouse went up in 1909, it took years for the other building to be constructed. The new city hall, built in 1928, was the last to go up. After the Duluth city government moved into its new city hall, the building became home to a variety of county, state, and federal social service organizations, such as the St. Louis County Poor Commission, the Minnesota Association for Crippled Children and Disabled Adults, and from 1943-1944 the American Red Cross. The building’s first floor housed retail establishments, including, from 1928 to 1933, an antique store run by A. Stella Thomas. Northern Electric Supply Company purchased the building in 1944 and two years later radically altered the lower portion of the Superior Street façade. Workers chiseled off the brownstone facing and replaced it with black Cararra glass panels incongruous with the building’s grand Romanesque features. More recently the building’s first floor was home to a music store, an art gallery, and a tattoo parlor. Owners of Duluth’s Fitger’s Brewhouse and Burrito Union purchased the building in 2005. They embarked on a restoration that restored the façade so that today the building looks very much as it did in 1889. While the interior of the first floor had been severely adapted throughout the years, the second floor was relatively untouched, and except for a larger, modern bathroom and an elevator, the owners have essentially restored that floor to its original condition. The project earned the building an award from the Preservation Alliance of Minnesota in 2012. Since 2005 rumors about the building’s past have spread wildly, including false tales of prisoner abuse, bootlegging, moonshining, and other illegal activities; none are true, but you can read about them here.